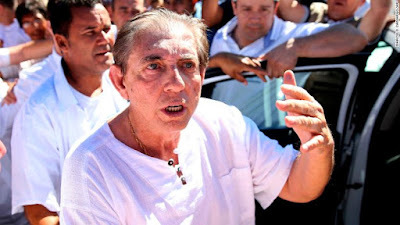 Lord God, we ask for your guidance and justice in the situation surrounding Brazilian faith healer João Teixeira de Faria. With thousands of people visiting this medically untrained man for spiritual healing each week, we are disgusted and devastated to learn that now at least 300 women have come forward to accuse Teixeira of sexual abuse. We pray for the truth to come out, whether Teixeira is guilty or innocent. With accusations, interviews and details seeming quite feasible to investigators, we anticipate hearing sad tales of abuse of power in this situation. We anticipate the need for thousands of lives to get back on track after putting their faith in someone untrustworthy. Lord, may all these people put their faith in Someone Trustworthy: YOU. And may they find professional, emotional, spiritual, medical or any kind of help they need within their communities. We pray for Teixeira to confess anything that needs to be confessed. We pray for justice to move forward correctly and swiftly. And we thank you that Teixeira’s abominable practice of calling on the spirits of dead doctors to perform so-called spiritual surgeries—sometimes even cutting patients without anesthesia—has ceased while he is in prison awaiting next steps. Please bring resolution in this situation. In Jesus’ name we pray, amen.